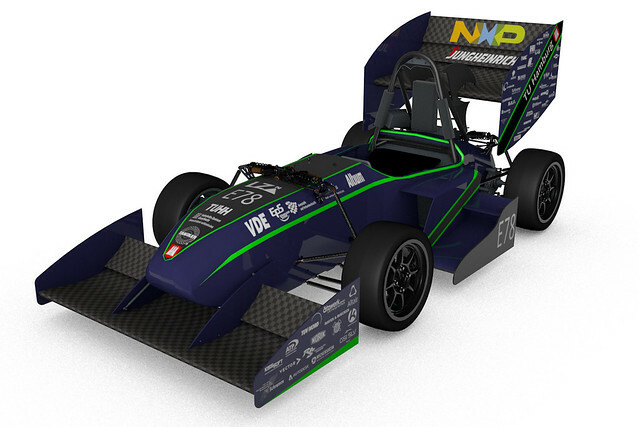 Der egn19-dv will be the third autonomous racecar by the e-gnition Team. Follow us on Facebook, Twitter and Instagram to stay up to date with the progress regarding the egn19-dv. 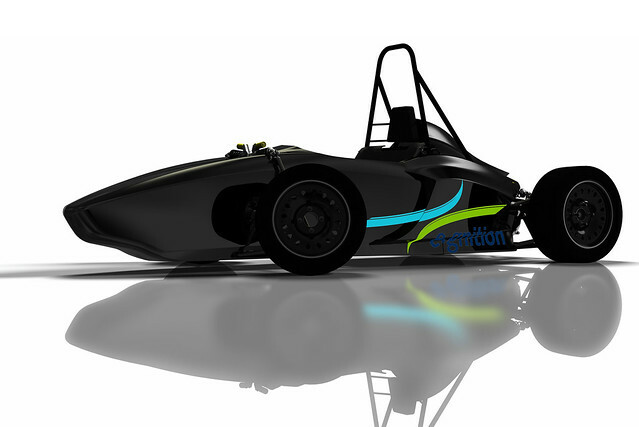 The egn19-ev will be the eighth car of the e-gnition Team. Follow us on Facebook, Twitter and Instagram to stay up to date with the progress regarding the egn19-ev. The egn18-dv is the conversion of the egn17-ev. Besides all-wheel drive it took over the complete aero package consisting of front lip, rear spoiler and side and rear diffusor. Steering during autonomous driving was made possible by a stepper motor on the steering column. During braking electrical energy is fed back into the battery via recuperation. A pressure booster from air to hydraulic pressure was specially developed for the emergency braking system. Three LiDAR (Light detection and ranging) sensors and two cameras were installed for the perception of the vehicle. The camera images are evaluated via a neural network. During the drive, an image of the environment is created by the system. A SLAM (Simultaneous Localization and Mapping) algorithm is used for this purpose. This determines the position of the vehicle in the world, which is why the racecar works without GPS. As every year, a major goal is to reduce the weight of a car to its predecessor. We also managed to save 30 kg on the egn18- ev. The biggest innovation is to make the operation of the vehicle easier for the driver. Therefore we redesigned the user interface. A display in the steering wheel with all important information shows the driver the status of the car. By the advancement of the vehicle we succeeded to finish the egn18- ev very early in the season. This makes it the most tested vehicle in the history of e-gnition. We were able to recognize errors early and fix them. This intensive test phase paid off during the season. For the first time we won the Autocross in the FSN and in the same year we made it to the first place of the FSA! Acceleration 0-100 km/h 2.8 sec. 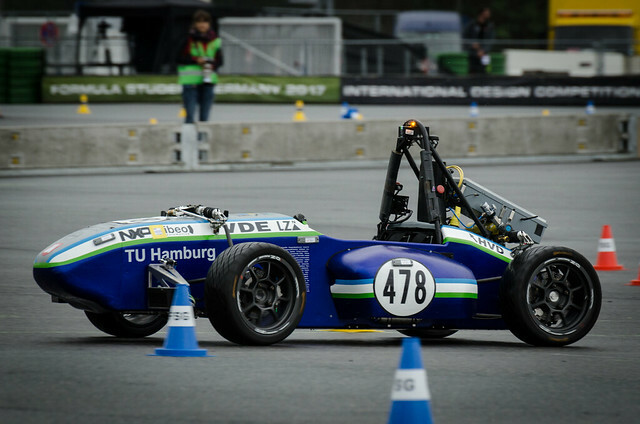 In the 2016/17 season, a team of alumni and active members was formed to participate in the Formula Student Driverless competition. Therefore the egn16- ev was converted to the egn17-dv. Sensors, computers and actuators had to be planned and installed. There were also some changes to the high voltage system necessary. In addition to the mechanical changes, a large amount of software had to be developed so that the car could drive autonomously. In order to master this gigantic task, our team consists of students from many different disciplines who work together in an interdisciplinary manner. In cooperation with institutes of the TUHH, individual topics of the vehicle are dealt with in master theses. With the egn17-ev we have made a big leap in development: The switch from rear-wheel drive to all-wheel drive. With four driven wheels, more torque can be transferred to the road, which leads to better acceleration and better cornering. In order to be able to use this type of drive even more efficiently, we have opted for an "in wheel package". This means that the electric motors are placed in the wheel hub so that the power transmission can be used more directly. This also saves a lot of space in the monocoque. 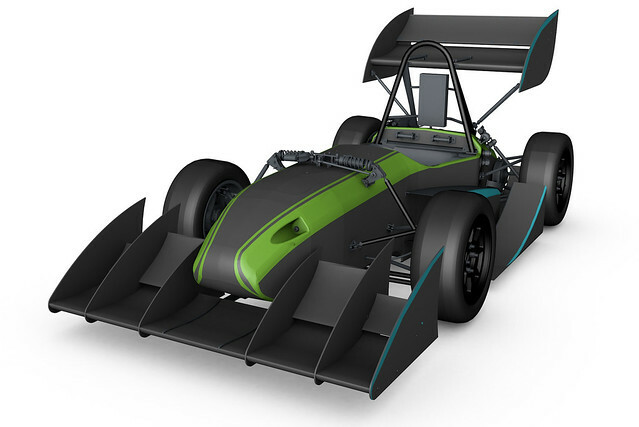 As a result, a completely new monocoque was designed that could be further weight-optimized thanks to a new manufacturing process using prepreg fibers. The aero design was also further optimized. For the first time, a drag reduction system (DRS) was integrated into the rear spoiler. This allows air resistance to be reduced by folding down a wing element on high-speed routes in order to save energy. With the egn15 we had made a big technical leap, and especially towards the end of the season the car showed the potential of its concept. For this reason, we have adopted and further developed its concept on a large scale. The egn16 is thus the evolution of the egn15. We paid special attention to the reliability of the racing car in order to be able to improve the performance through as much testing time as possible and to drive every discipline at the events. But not only the technology, but also the team was the focus this season. All members build the car exclusively in their spare time and don't get any money, credit points or the like for it. Through various internal events, the team grew together closely and can look back on a successful season. The main development-focus of our of egn15 are lightweight and maintenance-friendly construction. Lightweight construction as a key strategy for economical mobility. With less weight you use less energy while accelerating. Therefore, you can accelerate better with the same energy. By a maintenance-friendly car we achieve short recovery times. As a result, we maximize the test time, so that we can achieve the best results in the competitions as possible. 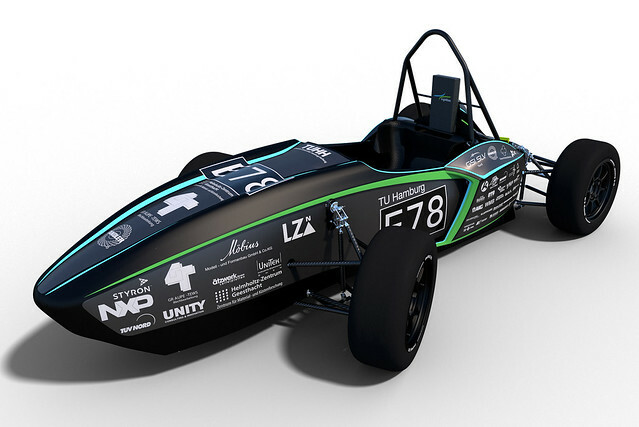 The egn14 is the third vehicle developed by the students of the TU Hamburg. 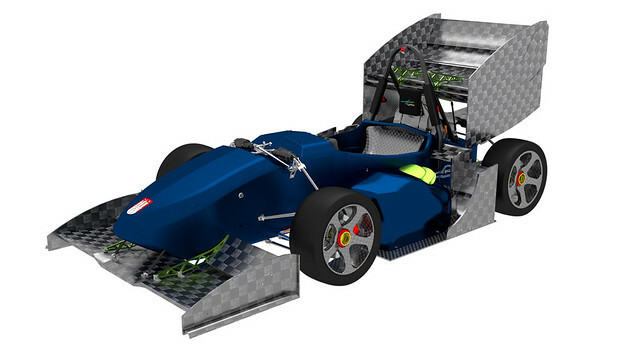 The team behind the racing car already consists of 56 students of all disciplines and semesters, who, in addition to their studies, are realizing this vehicle within one year. In the field of lightweight construction, the egn14 has undergone enormous development compared to its predecessor. After a saving of 50 kg from the egn12 to the egn13, we could also save 50 kg with the egn14 and thus significantly increase the performance. 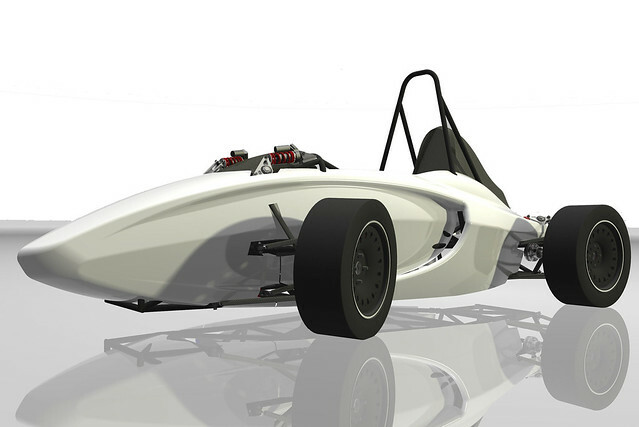 The egn13 is the second race car from the race car forge of the Technical University of Hamburg. One year after the debut of e-gnition, the egn13 is the logical further development of its predecessor. Thus it was possible to save a total of 50kg, which leads to a new vehicle weight of 272kg. The new gear ratio optimized transmission increases the acceleration of the egn13 and gives a further competitive advantage. By including the driver as the central element of the vehicle, we were able to construct the car ergonomically from the inside. This allows the driver to concentrate solely on driving. The electronics themselves decide which faults have an influence on the driving behaviour and which faults are safety-critical. Through our self-developed telemetry, which is based on the E-Call technology of our main sponsor NXP Semiconductors, we have real-time access to the vehicle's data. 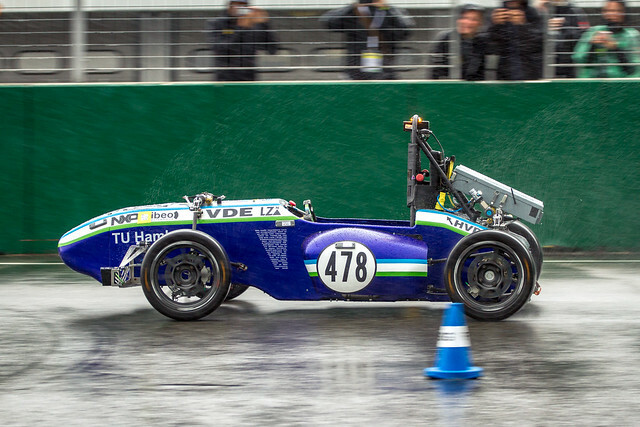 In 2011, a group of 50 students from the Technical University of Hamburg came together to build an electrically driven racing car for the student series "Formula Student" within one year - previous record time! Thus the egn12 the first racing car of the TU Hamburg at all. With a weight of 325kg and a power of 85 kW we participated in the international Formula Student competition at Silverstone (England) and Hockenheim (Germany).